The SS Daisy Legal History Committee is a committee of the Law Society of Newfoundland and Labrador whose mandate is the preservation of Newfoundland and Labrador’s legal heritage, including the history of law, the courts, the lawyers and the Law Society. The name of the committee is taken from the government boat SS Daisy that carried lawyers, judges, sheriffs and clerks to the courts in smaller communities in pre-1949 Newfoundland. $81.35 HST Inc. The SS Daisy Legal History Committee works to date include taping and transcribing oral histories of senior members of the Bench and Bar, preserving the Barrister’s Roll which dates from 1826, and publishing the last volume of the Newfoundland Law Reports which contains previously unreported decisions of the Supreme Court for the two years immediately before Newfoundland and Labrador joined confederation.The frontispiece to the volume, honi soit qui mal y pense, was prepared by George Horan, Q.C., depicts the three judges whose decisions are reported in the volume sitting en banc and is available for separate purchase. 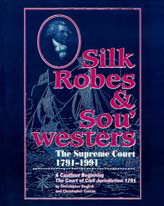 Silk Robes & Sou’westers – The Supreme Court 1791-1991; A Cautious Beginning: The Court of Civil Jurisdiction 1791. The bicentenary of the establishment of Newfoundland’s supreme “court of civil jurisdiction” marks the emergence of a statutory regime from which the present Judicature Act, court system, jurisdiction, procedures, and officers have evolved. In light of the modest material, demographic, institutional and experiential base upon which the Act of 1791 was erected, the process of tailoring and adapting a system of law to new, often unforeseen, demands over 200 years marks a considerable achievement. This essay traces the emergence of the Act of 1791 from earliest times. 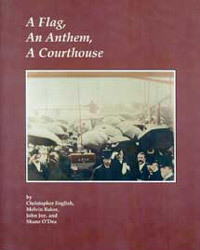 A Flag, An Anthem, A Courthouse. A people often gives voice to its identity by constructing public monuments which express pride in past achievements and signal future hopes and intentions. This urge towards self-definition was especially marked in St. John’s at the turn of the century…Public buildings, memorial crosses, a flag, a national anthem, a trans-island railway and modernized harbours expressed a complementary self-awareness. Their creators wished to present themselves as confident, progressive, and modern yet solid, responsible and alert to the debt preceding generations. Illustrations throughout. The appointment of Justices of the Peace constituted the first attempt at year round governance on this island. It provided a form in which personal and, increasingly, commercial disputes could be arbitrated when the Governor and his surrogates were absent in the winter months…During the summer of 2002, the people of Placentia celebrated the 100th anniversary of the building of the present courthouse in Placentia. It was then the oldest wooden building in Newfoundland still in full time use as a courthouse. It replaced the courthouse that had been built in 1774. Illustrations throughout. Down North on the Labrador – The Court of Civil Jurisdiction 1826 to 1833. Though tied to the history of the island portion of the Province, Labrador from earliest times had its own unique legal traditions. This is hardly surprising when we recall that the law at once reflects and helps shape the society out of which it springs. From the outset, the administration of justice in Labrador had to respond to unique challenges of a mixture of cultures and languages, an immense geography and a physical separation from the island part of the colony. This was as true for Judge Paterson on his arrival in Indian Harbour, Labrador, in 1826 as it is today. Illustrations throughout. 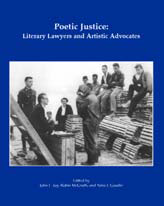 Poetic Justice: – Literary Lawyers and Artistic Advocates. It has often been said that the law is a jealous mistress, who demands of those who would succeed in it an earnest and entire devotion. The poet Emerson, however, makes the same claim for art, and admonishes that if a man has a genius for painting, poetry or music he makes an ill provider. This small anthology puts the lie to both aphorisms. Consider James Boswell, Leon Tolstoy, A.M. Klein, Frank Scott and others. All boast of two mistresses – the law and art. B & W and full colour illustrations throughout. 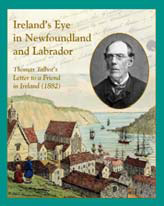 Ireland’s Eye in Newfoundland and Labrador – Thomas Talbot’s Letter to a Friend in Ireland (1882). Talbot, an Irish emigrant, came to Newfoundland in 1837 and was active in the public life of the colony almost from the time of his arrival. His text published first in 1832 and not now readily available, provides an insightful account of “the conditions and circumstances” of his new home on this arrival and over a period of more than 40 years and documents his various contributions to public life as an educator, writer, classical scholar, and politician throughout the period. B & W and full colour illustrations throughout. 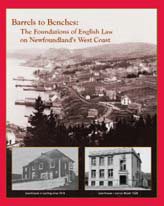 Barrels to Benches – The Foundations of English Law on Newfoundland’s West Coast. When Sir Robert Bond addressed Newfoundland’s House of Assembly in April 1904 to announce that, as part of the diplomatic arrangements signed between the United Kingdom and France, the French Shore Question had been resolved, he assured his listeners that this issue had long been a thorny cause of irritation…so opens Olaf U. Janzen’s contribution to this collection of essays in celebration of the official opening of the Corner Brook Consolidated Courthouse on 3 May, 2010. Contributing authors include: Christopher English, Michael Wilkshire, James K. Hiller, Christopher Curran and Melvin Baker, and Chief Justice Clyde K. Wells. B & W and full colour illustrations throughout. The Face of Justice on Newfoundland’s Northeast Coast. The essays contained in this volume trace essential elements of the face of justice on Newfoundland’s northeast coast from the migratory fishery of the 18th century to the pre-confederation decades of the 20th. They were written by academic and by public community historians and reflect the growing interest in our legal history both within and outside the university community. They show not only that the sources of law and the level of justice activities varied as demographic, social and economic conditions changed throughout this period, but that the law and its institutions formed an integral part of the fabric of everyday community life and were valued as such. 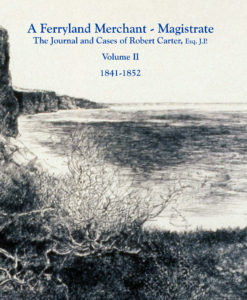 A Ferryland Merchant – Magistrate: The Journal and Cases of Robert Carter, Esq. J.P. 1832-1940 Vol. 1. Robert Carter served as Magistrate in Ferryland at a pivotal point in Newfoundland’s history: the tumultuous period from the grant of representative government in 1832 to the emergence of responsible government in 1855. 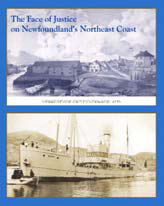 His journal offers an unrivalled picture, over a sustained period of 21 years, of life in this important Newfoundland outport community throughout almost the entirety of this formative period. When combined with his cases in Ferryland’s Court of General and Quarter Sessions during this time, what emerges is an incomparably rich picture of a vibrant 19th century Newfoundland community. B & W and colour illustrations, a glossary of terms, biographical profiles, the 1840 Ferryland District Voters’ List and a select bibliography supplement the text. A Ferryland Merchant – Magistrate: The Journal and Cases of Robert Carter, Esq. J.P. 1841-1852 Vol. 2. “With the publication of the Volume Two of the journal of Robert Carter, the Law Society of Newfoundland and Labrador has made a wonderful contribution to our knowledge of the province’s history and culture. As with Volume One, the editors have done an outstanding job in producing a book that is at once scholarly and accessible to the general reader. 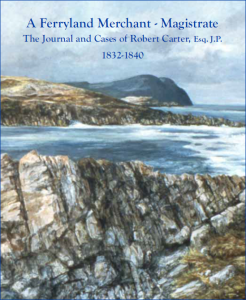 By publishing an unabridged version of the journal up to 1852, they have given us the remarkable ability to trace Carter’s life and career longitudinally, and to make direct comparisons across different eras in the history of Newfoundland and Labrador. This is no small feat, and we are all in their debt. My advice to readers is simple: plunge in and immerse yourself in a world that is at once foreign and familiar, though keep in mind the Law Society is not responsible for hours lost in pleasurable reading.” This volume, in two parts, completes the documentary record of Robert Carter’s diary and Court cases for the entirety of the 21 years of his diary, 1832-1852, begun in Volume I. The text is accompanied by: B & W and full colour illustrations, the transcribed text of the two Reports of the Commissioners adapting the Criminal Law of England to the Colony, the “Rough Copy file” of Carter’s cases 1848-1852, the Ferryland District Voters’ List 1847, a glossary of terms, biographical profiles and a select bibliography. D. W. Prowse’s Manual for Magistrates in Newfoundland (1877). 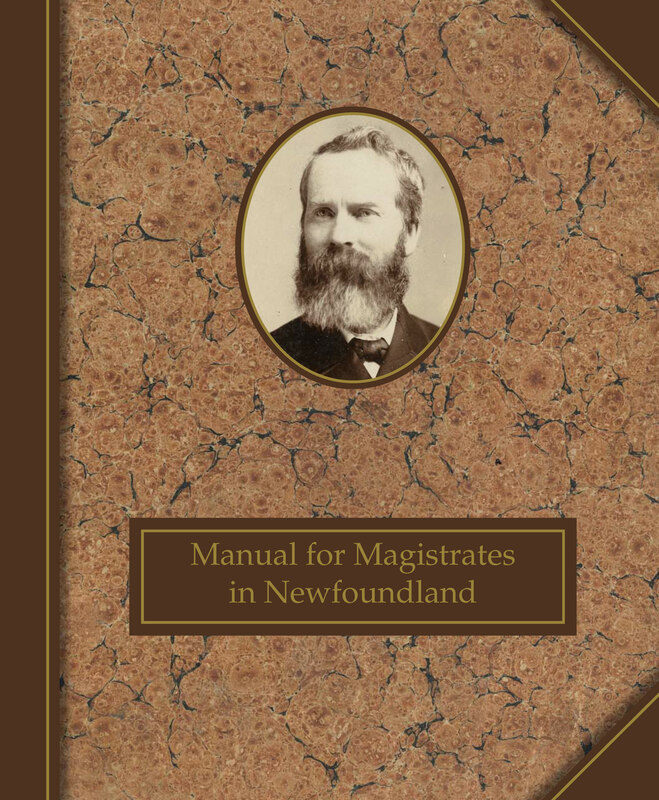 This new printing of D.W. Prowse’s 1877 Manual for Magistrates makes available to the Bar and to the public one of the ‘classics’ of Newfoundland’s 19th century legal literature. The reprint is based on Sir James Spearman Winter’s (# 52 on the Roll of the Law Society) copy of the original, of which only 100 were ever printed. The original is now extremely rare. The book is accompanied by an introductory essay by the editors and by an array of related photographic illustrations from the period. This printing is a limited print run. 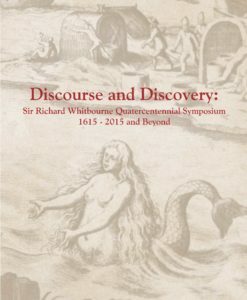 Discourse and Discovery: Sir Richard Whitbourne Quatercentennial Symposium 1615 – 2015 and Beyond. In June 2015, the Supreme Court of Newfoundland and Labrador, in conjunction with the National Judicial Institute and the SS Daisy Legal History Committee of the Law Society of Newfoundland and Labrador, held a symposium to mark the 400th anniversary of the holding by Sir Richard Whitbourne of a court of Vice Admiralty in Newfoundland. The holding of the court at Trinity on June 4, 1615, which was repeated in other communities along the eastern coast of the island during the summer of 1615, is reputed to have been the first such formal judicial proceeding held under the umbrella of English admiralty law to that time in North America. This publication contains the edited versions of most of the papers and presentations made on the first day of the symposium with its focus on the province’s legal history, plus some additional historical material. Contributing authors include: Dr. Melvin Baker, Dr. Jerry Bannister, Hon. David M. Brown, Hon Justice Thomas A. Cromwell, Christopher P. Curran Q.C., David C. Day Q.C., Dr. Peter E. Pope, Dr. Philip Girard, Hon, J. Derek Green, Professor Emeritus W. Gordon Handcock, Hon. Judge John L. Joy, Professor Emeritus John McLaren and Dr. Lynne Phillips. B & W and full colour illustrations, a timeline of milestone events in the history of English Law and Judicature in Newfoundland and Labrador and a select bibliography supplement the text. 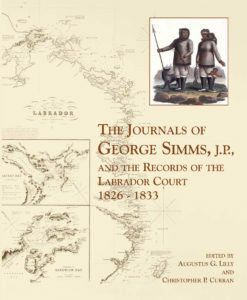 The Journals of George Simms, JP., and the Records of the Labrador Court 1826—1833. The Judicature Act of 1824 (5 Geo. 4, c. 67) contained provisions for the establishment of a Court of Civil Jurisdiction on the Coast of Labrador. Trepassey merchant and magistrate George Simms, served as Clerk of that Court and as a Justice of the Peace for the District of Labrador from 1827 to 1833 when the Labrador Court was abolished by the fledgling Newfoundland Legislature as an unwarranted expense. This book, in two volumes, contains the, heretofore unpublished, text of George Simms’s Labrador Journal 1830-1833 together with an indexed transcription of the Records of both the Civil Court and the Sessions Court for the period 1826-1833. 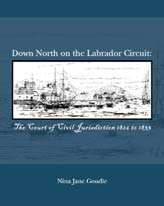 Simms’s Journal provides an unvarnished account of the daily life of the Court on the Labrador Coast. Despite the Court’s short life its existence played an essential role in the 1927 Privy Council decision in the Labrador Boundary Case. Appendices of archival material, Indices of Words and Phrases, Place Names, biographical profiles, maps and period illustrations supplement the text. 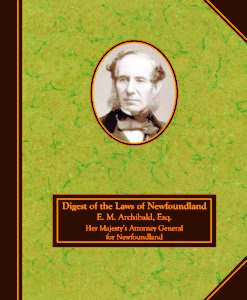 Published by newspaperman Henry Winton in 1847, Archibald’s Digest of the Laws of Newfoundland was a staple on Newfoundland judges and lawyers’ bookshelves for more than 100 years. This reprint is a copy of an 1847 original bearing the signature of F.B.T. Carter, who served as Chief Justice of Newfoundland from 1880-1898. In addition to Archibald’s Notes and Comments on the 1824 Act and Royal Charter, Appendices 1 & 2 reproduce the August 1831 Report of the Judges of the Supreme Court of Newfoundland to His Majesty’s Government upon the Judicature Bill and the February 1832 Report of His Majesty’s Attorney General of Newfoundland on the Judicature Laws of that Colony, published here together for the first time. 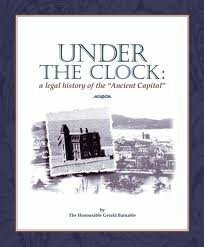 Taken as a whole, the Reports and the Digest provide an insightful account of the development of the law in Newfoundland and Labrador during the early 19th century, the issues arising in respect thereof as identified by Judges and practitioners and proposed fixes. Complete sets (with the Newfoundland Law Reports 1947-1949) may be purchased from the SS Daisy Legal History Committee at a cost of $438.85 (HST included). Purchases may be made by cash, cheque, or money order.